Life couldn’t be sweeter for Nadiya Hussain. The Great British Bake Off winner is the latest big name to join Foodies Festival Christmas in Harrogate on the 11th-13th December, where she’ll be sharing her favourite recipes to help create the perfect Christmas banquet. “We’re moving to Milton Keynes,” she says with a sense of excitement in her voice. After moving from Luton to Leeds to marry husband Abdal ten years ago, Nadiya is ready to return back south. “My parents are really hands-on with the kids. I need their support. I’ve been away from home too long. “It’s definitely a balancing act. I’m still being mum and staying at home but I also have to do all these other things on top. It’s tough and we’re moving house as well so I haven’t baked in seven days and that seems like a very long time to go without baking. I’m itching to bake something. I feel like I’m neglecting my oven at the moment I feel awful. 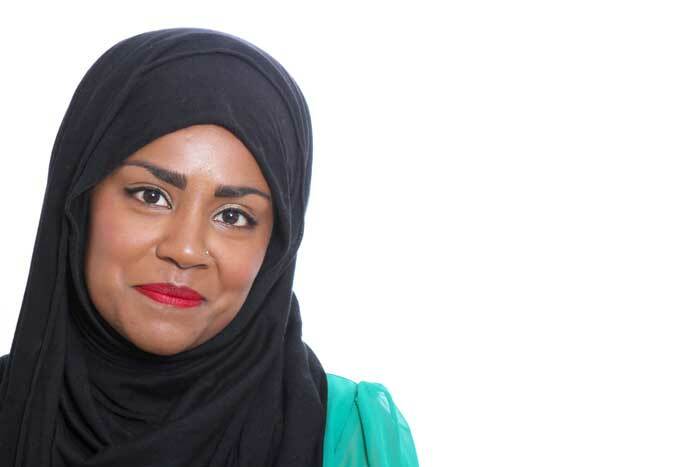 When Nadiya next comes up north, she’ll be presenting some of her famous bakes in Harrogate. “I’m baking a chocolate, raspberry and mint tart and my chocolate and black olive cookies, which the audience will be able to recreate at home and wow their friends and family with. As my soggy digestive plops into my tea, I’m curious to know where to start when it comes to baking. I’m a complete novice and my results at baking ‘butterfly buns’ in my school years were hard enough to smash a window or two. “I got my kids into baking. They’re the only people I have taught to bake and any other members of the family say: ‘Oh, you do such a good job, you do the baking, we’ll just stay clear!’ With the kids I started with biscuits, because you can get your hands in. Simple things like biscuits and cupcakes are always the way to start and then work your way up to different techniques, tarts and pies and bread. Nadiya was renowned for her artistic culinary skills, re-creating her wedding cake and even creating a stunning chocolate peacock that would have made a great hat for Ascot. “The judges are like fairies compared to my kids. I have a rule in my house that if they don’t like something they don’t have to eat it. I won’t force them to eat anything they don’t like. If they don’t like it they will literally say: ‘That’s horrible’ and that hurts. When I was on the show I experimented a lot and made something with lavender. I put it in my son’s mouth and he said: ‘That’s disgusting. Why would you do that to me?’ He kept coming back every half hour saying ‘I’ve still got that flavour in my mouth!’ They just don’t sugar coat anything! Her baking prowess certainly evoked a lot of emotion for judge Mary Berry. When Nadiya was announced as the winner, Mary was overcome with emotion. “I think she was aware how close I am to my family. I bake from my heart and I’m sure she sensed that, which is probably why she was quite emotional. The term ‘little one’ used by Mary would have seemed ridiculous if she had entered the competition three years ago when Nadiya was a size 16. This lass has overcome every obstacle in her way, one of the obstacles being the bad press she received when she first entered the show. “As soon as my name was in the press they were so many negative comments some saying ‘She’s probably the only one on benefits’, very negative comments. At this point I already knew I had won, so I thought: ‘Let it unfold’. I don’t care how people perceive me. I did what I could and I did my best and that’s what’s important. “I think that’s the case wherever I go. If I’m stepping into something new I always feel a little bit nervous. I’m not going to hide the fact that Muslims probably haven’t represented themselves well in the media and I think I worry that being a Muslim can sometimes hinder me. It was very easy to be at home, hidden away, living life day to day. I was so aware that this was prime time TV, and worried about what people would say or think. “I’m Bangladeshi, I’m a Muslim, I’m a stay-at-home mum. I’m all of those things and I think being a mixture of all those things there are so many boundaries that I didn’t necessarily put on myself but that society puts on me. You don’t need to put limitations on yourself, slowly but surely one wall was broken, then another, so I didn’t feel any of those boundaries any more and that’s how I feel now. Week after week I broke all those boundaries for myself. Previous articleLancashire man paints his very own Canaletto… in his garage!